This simple isometric exercise can be performed at work, or in any chair with suitable armrests. If a co-worker sees you and asks what you're doing, tell them it's yoga. Sit in a chair that has sturdy armrests at about elbow height or higher. Brace your hands on the armrests. Take a firm grip. Now, push straight up with both arms. 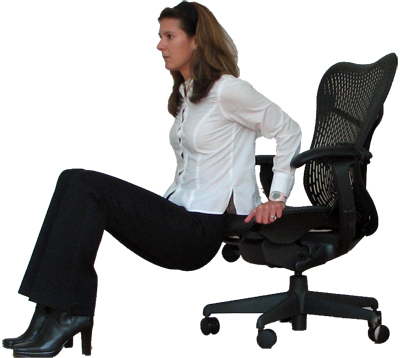 Hold this position for five seconds, then slowly lower yourself back into the chair. This exercise strengthens and tones the pectoral muscles, and increases blood flow to the breasts.